In 1998 the popularity of coco rose enormously causing a shortage of its raw material. As the leading potting mix and substrate producers could no longer ignore the product, they started to use raw material from new sources without considering the quality aspects. This resulted in huge crop damages, especially in France and the Netherlands. In order to prevent delivery problems in times of high needs CANNA went overseas and made substantial investments in local infrastructure. Concrete bunkers were built for controlled storage, mechanization took place and contracts were signed with selected farmers. Advantages: controlled supply and an ideal size (0.5 inch sifting), harvesting without potting mix contact, and controlled ripening/composting. All this effort results in an insect, seed, weed and disease free product, which was the first one awarded with the RHP standard in the Netherlands. 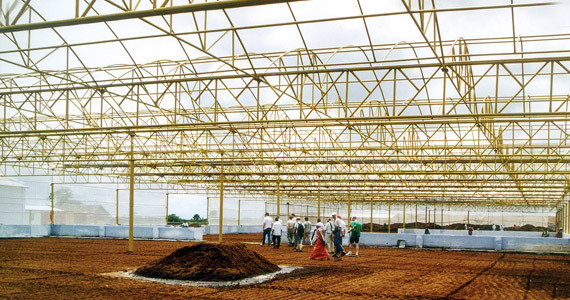 The RHP Foundation (Quality Mark for Substrates) is a well-known concept within the potting mix sector in the Netherlands for controlling substrates and raw materials. The inspection is not limited to the finished product but covers the sourcing and processing of raw materials all the way to the CANNA Coco Professional Plus 50 litre bag. The RHP quality mark has been included in the certification package of ECAS (European Certification body for the Agri­cultural Sector). ECAS monitors CANNA’s entire produc­tion from the factory in India to the end user, to ensure that all require­ments for CANNA COCO substrate certifi­cation are satisfied. RHP products meet the highest chemical and physical demands and are free from weeds and pathogenic organisms. RHP standard can be met in two ways; either by steam sterilizing the coco materials or by completely controlling the pro­duction process. A disadvantage of a steam-sterilized product is its inability to naturally protect crops against harmful moulds, like pythium. Steaming also converts plant usable Nitrate nitrogen to plant toxic Nitrite nitrogen. CANNA went the hard way and decided to refrain from steam sterilizing its coco. Our buffering process allows us to ‘pre-program’ the medium to a certain age. This ensures you get the same consistent, high quality material time after time. CANNA COCO is a 100% natural grow and flowering medium, which has proven its value across years and years. CANNA, the coco pioneer from Holland, has played an important role in the current status of coco in horticulture. CANNA COCO is not only a high quality product, but also an honest and environmentally friendly product. For many years the raw material was considered waste material, and enormous useless “Coco Mountains” appeared in the landscapes of countries like Sri Lanka and India. By developing a special biological composting process this “waste” was transformed into a high quality product. This innovation was, and still is, an important contributor to the local economy of India and Sri Lanka. This and the unique growth characteristics ensure CANNA COCO is the medium of the moment and the future! Apart from a better visual appearance the root development is easier and superior in coco compared to the develop­ment on rock wool. “Due to a healthier root development a better growth is obtained and fewer problems occur. This results in a longer shelf time, as well as a better colour and taste,” claims Hartman. His company aims at maximum quality. This is of vital importance since the client only wants the highest quality. The excellent rooting on coco substrate combined with biological control measures will even raise this quality according to Hartman. The leaves of the pepper plants feel strong and turn slightly upward. “Isn’t this what every grower wants,” he says.